Barbecue grills are available in charcoal, gas, and electric varieties, and offer a great-tasting way to cook your food. 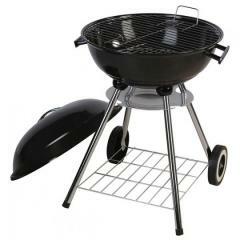 This site discusses indoor and outdoor grills from selected grill suppliers. Sirloin steaks and onions cook on a gas grill. The person manning the grill pierces an onion with a fork, getting ready to add it to the cooking food. A gas grill is a necessary piece of equipment for any backyard barbecue. This barbecue equipment directory comprises information about barbecue equipment manufacturers throughout the United States. The barbecue grill image on this page depicts a kettle-style charcoal grill. Each directory listing includes contact information and a website link. 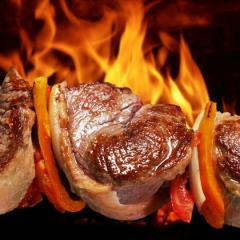 This barbecue restaurant directory page comprises information about barbecue restaurants in Orlando, Florida. Each Orlando barbecue restaurant listing includes a website link and a phone number. This barbecue restaurant directory page comprises information about barbecue restaurants in Memphis, Tennessee. Each Memphis barbecue restaurant listing includes a website link and a phone number. This barbecue restaurant directory page comprises information about barbecue restaurants in Dallas, Texas. Each Dallas barbecue restaurant listing includes a website link and a phone number. This barbecue restaurant directory page comprises information about barbecue restaurants in Houston, Texas. Each Houston barbecue restaurant listing includes a website link and a phone number.